Cornell Wright recently participated in the "See Yourself Here" Diversity Outreach Event held at the University of Toronto Faculty of Law. The event welcomed high school, university and mature students from diverse communities and disadvantaged backgrounds who are interested in pursuing a legal education. 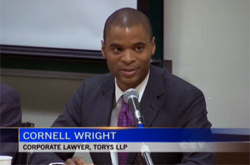 Cornell, an LLB and MBA graduate of the University of Toronto, provided inspiration for students considering a career in the legal profession. View the news report here.